Known as the Valley of the Sun, Ramona sits in the heart of San Diego County with amazing views of the surrounding mountains. Ramona has that small town feel but is just a car ride away to the big city life of San Diego. Ramona is a great place for a family lifestyle with excellent schools and neighborhoods including Mt. Woodson and the San Diego Country Estates. There is an assortment of activities, entertainment and local businesses making Ramona an exceptional place to live. Ramona hosts an annual rodeo and fair and also offers horseback riding, farmer’s markets, biking, wine tasting, hiking, antiquing, golfing, concerts, art shows, and airshows. Located a good 45 minutes away from downtown San Diego, Ramona is the ideal place to live for those who want to live away from the hustle of the city. With plenty of gorgeous scenery and recreation, Ramona is small town living just close enough to the amenities of the city. Ramona has lately gained acclaim for its great golfing facilities. The San Vicente Inn & Golf Club, the original area course, is an 18-hole championship course and has been recognized as one of the best in San Diego. It is open to the public, although only local residents can become members. The newer course, another 18-hole, is the Mt. Woodson Golf \& Country Club course. This one is renowned for the natural beauty surrounding it; it rests up against the base of Mt. Woodson and is bordered by century-old oak trees. After a game, many golfers stick around the country club to play tennis or take a swim. Those who prefer a more fast-paced sport often quickly catch on to cycling. 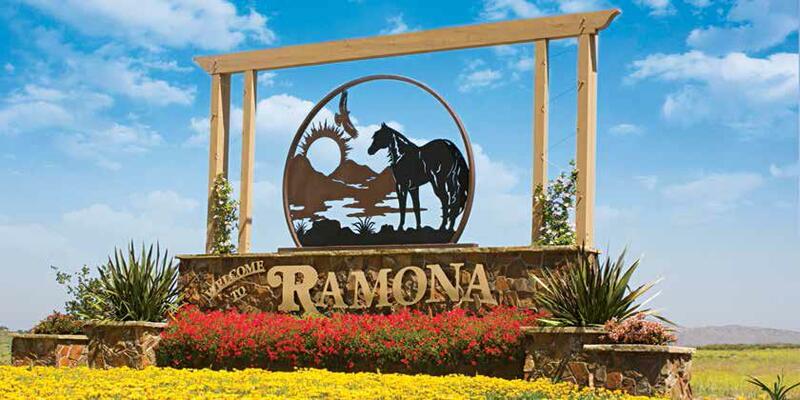 Ramona has a variety of roads, paved and unpaved, ideal for a ride, and residents scope out the best horse and fire trails for the next weekend. There’s quite a community of cyclists here, and the area has raised professional racers and Olympians who got their start on the hills around their Ramona homes.